Includes nearby motel/resort suggestions. Also, let us suggest some activities in the Rancho Europa/Nederland area. See day hikes from our ranch and hikes within driving distance from our ranch. Check out the PUMA (Preserve Unique Magnolia Assn.) Web site for more about the neighborhood and preserving the special environment of the area. Our ranch is a fine place for small SwRI space science meetings and for testing astronomical instruments in a nearby, relatively dark-sky location. Our 10-acre ranch, abutting Roosevelt Natl. Forest in the high (8200 ft.) foothills of the Front Range, is 9 miles southwest of downtown Boulder and 5 miles east of Nederland. We're on an open, sunny, south-facing part of Winiger Ridge, surrounded by ponderosa pine forest with open fields below. We're on the north side of Lazy Z Rd. (CR97E) just before it ends at a gate (look for our stone monolith); Lazy Z is a graded, dirt county road reached from Boulder or Nederland via Magnolia Dr. Driving time from Boulder is about 30 min. by the direct route, but we recommend an alternate, more level route (8 min. longer, via Nederland) esp. for flat-landers or for anyone during mid-winter, since Magnolia ascends very steeply the shaded, often icy north-facing side of Boulder Canyon. From Denver International Airport, the shortest route is via the new Tollway (E-470 and Northwest Parkway) to Rte. 36 near Flatirons Mall, then through downtown Boulder and up to the Magnolia neighborhood; driving time from DIA is about 70 min. From Denver, the best route is through Arvada or Golden, then up Coal Creek Canyon on C72. From points west, take the Eisenhower Tunnel on I-70 to cross the Continental Divide and then the Central City Parkway (exit #244) to Central City, then to the Peak-to-Peak Highway in Blackhawk, north toward Nederland and Estes Park, but then turn off on Magnolia Dr. just before Nederland to Lazy Z; driving time from the Tunnel to the ranch is about 70 min. When you arrive, turn left (where our circular drive joins) and drive straight up the paved section toward our house. or much longer driving time after snow. Check-out alternative route below. first mile east of C119. one). It is considerably faster (at least 10 min.) for getting to downtown Boulder. and proceed about 4 miles to the traffic light at C72, then turn sharply right (west). a few miles and a 10 minutes longer than going through Boulder). elevator to 3rd or 4th floor. bears right after 3.4 miles (this detour will add 10 min. to the trip). * Save 2 min. (in light traffic only, not at rush-hour) by exiting I-70 at Ward Rd. 2nd stop-light (C72), turn left and proceed from 44.2 miles directions above. From Rancho Europa TO Denver Intl. Airport. Boulder to DIA via NW Pkwy." 2.1             4        Bear left (basically straight ahead) on Magnolia Dr.
to follow C72 to I-70; several turns are detailed in above footnote FROM airport. McIntire route through Arvada, described in footnote to directions FROM airport. From Points West via Interstate 70, Central City, and Peak-to-Peak Hwy. bound on-ramp), proceed under "Central City Parkway" sign. to speed bumps, speed trap, new stop signs. Older, Longer, More-crowded Route from Points West via I-70 and Blackhawk. starting from exit #243 via Central City. (1) SUNDANCE LODGE & CAFE. 800-817-3797, 303-258-3797. Closest motel to ranch (about 5 miles). Clean, simple, rustic, nicely appointed, shower (no bathtub), inexpensive (about $50 per night), attached excellent restaurant and bar, exceptional views of Continental Divide peaks from every room and from the outdoor deck of the cafe, horseback riding after Memorial Day. Located in the country, one mile south of Nederland, a few hundred yards north of the intersection of the Peak-to-Peak Highway (C119) and Magnolia Dr. (which leads east towards our ranch). (2) THE LODGE AT NEDERLAND (Best Western). 800-279-9463, 303-258-9463. Superior accomodations, downtown Nederland, 55 Lakeview Drive at C119. Rates $75 - $95. Wonderful mountain-style rooms, many with fireplace or wood-burning stove. Continental breakfast; half-a-dozen restaurants within walking distance. A little over 6 miles from our ranch. Center-of-mountain-town environment. (4) NUMEROUS ACCOMODATIONS in (or closer to) Boulder: the elegant old downtown Boulderado Hotel (on the pedestrian mall, 442-4344), the Alps Boulder Canyon Inn (303-444-5445, historic luxury B&B featuring afternoon tea and evening desserts, 12 rooms $122 to $188, toward our ranch in Boulder Canyon), Boulder Mountain Lodge (rustic, by the creek in Fourmile Canyon, 444-0882), the Magpie Inn (downtown B&B, moderately expensive, 449-6528), the large, Millennium hotel (once the Regal Harvest House; in the shopping district east of downtown, tennis courts, 443-3850), the Golden Buff (442-7450, standard in-town Best Western motel), Days Inn (cheaper, 499-4422), and many others. Note: Clark's office is in "downtown", walking distance from Magpie and Boulderado. A luxury hotel, the St. Julien, located one block west from Clark's office, opened in February 2005. (5) BED & BREAKFAST PRIVATE HOMES IN NEDERLAND (recommended by Visitor's Bureau some years ago; we haven't checked them out). Jackson's Whispering Pines (258-3210). Lakeview B&B (258-3165). Crum's B&B (258-7922). Betty Bloss (258-7666). (6) OTHER ACCOMODATIONS IN THE MOUNTAINS. Gold Lake Mountain Resort (very secluded cabins, very expensive, fine restaurant, north of Ward, about 40 min. drive from ranch, 459-3544 [rumored to have closed in 2010]). A Nook in the Woods B&B (Coal Creek Canyon, 642-3271). The Goldminer Hotel (and Rocky Ledge Cabin), in Eldora Natl. Historic District (9 miles from ranch, within walking distance of Hessie trailhead to Continental Divide), 100-year-old B&B with hot tub, $55 to $179 (258- 7770). 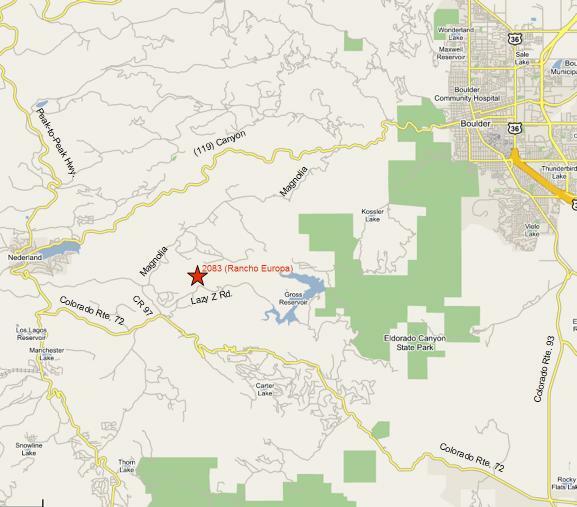 Day Hikes from Rancho Europa. Hikes within 40 min. Drive. SwRI Boulder Office (Dept. of Space Studies) Homepage.